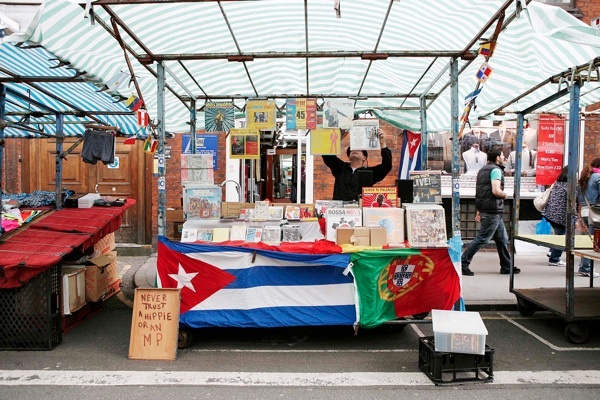 Readers may have been wondering what became of Jimmy Cuba, the legendary music dealer of Spitalfields, who quit in 2010 after a decade in which his Latin beats became the signature soundtrack of the market. 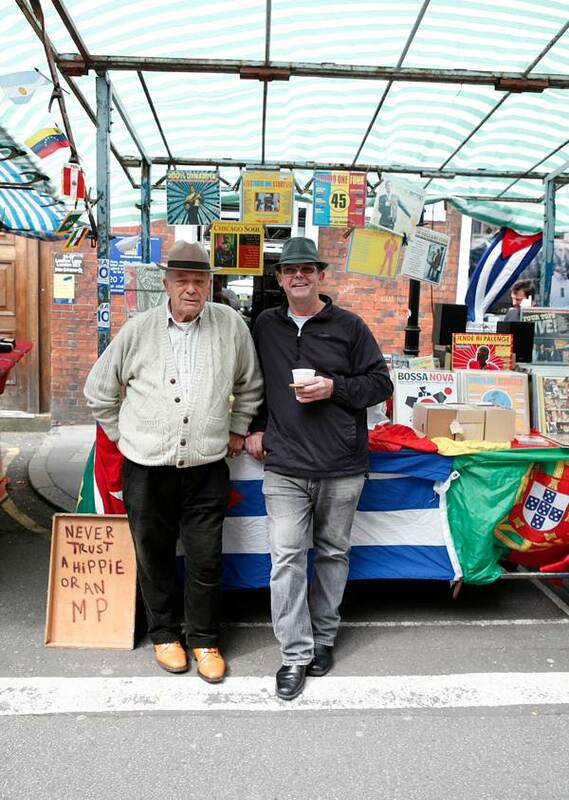 More than a year later, Jimmy has popped up again in Leather Lane Market, where he started out thirty years ago and where I came upon his melodious tunes drifting through the crowd last week, when Spitalfields Life Contributing Photographer Colin O’Brien and I walked over to welcome him back. 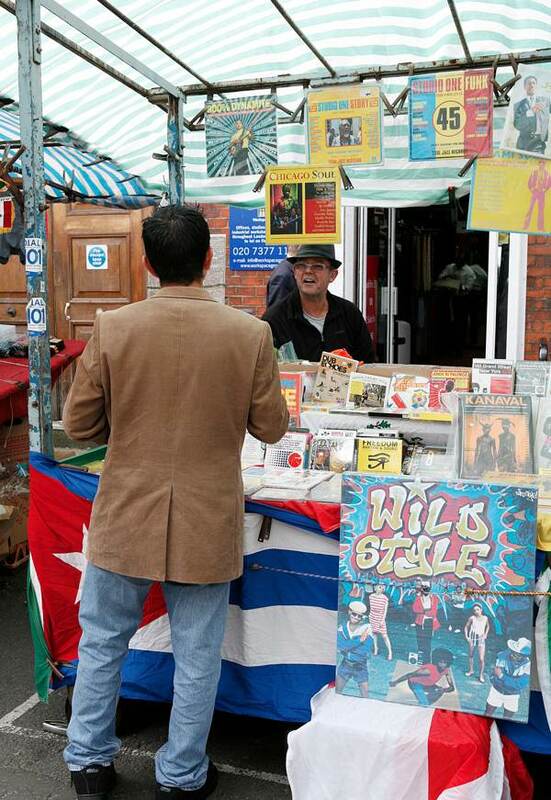 We heard the music before we saw him, and - there he was – looking rejuvenated and relaxed, bopping around behind his stall in the sunshine, still wearing his trademark leather hat and still displaying his famous comic notices. 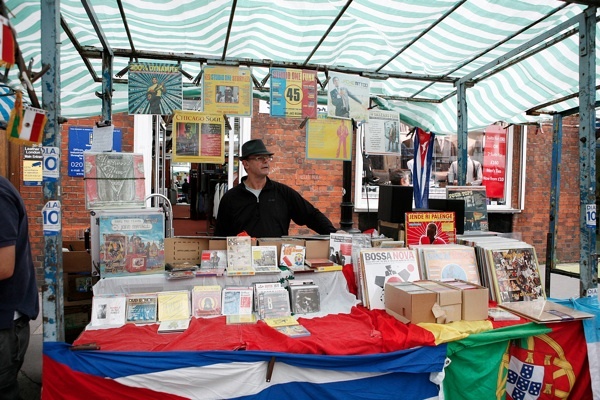 In fact, to those that know him , it was no surprise that Jimmy had returned to market life, since he began working on a fruit and veg stall in Romford Market as a child, even before he started in Leather Lane selling his record collection to pay his rent all those years ago, long before he ever came to Spitalfields. It was obvious that this existence would prove irresistible to Jimmy, as he admitted to me when I joined him behind the stall. 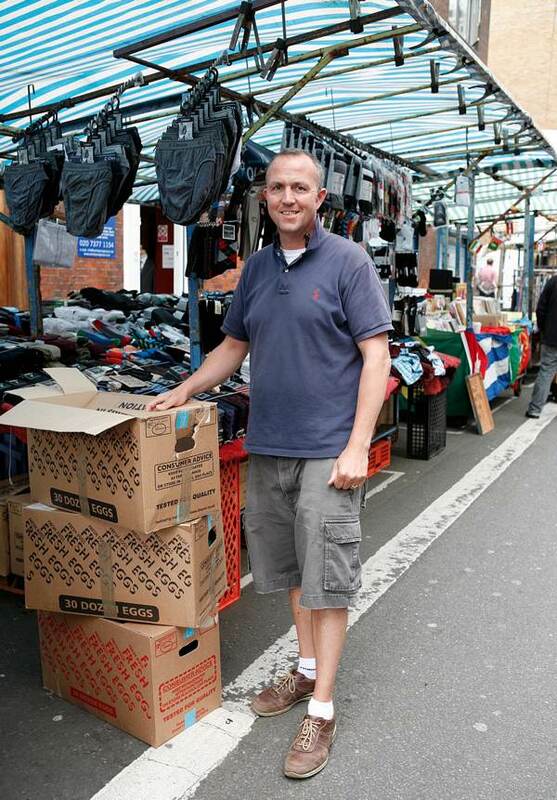 Returning to trade in Leather Lane, Jimmy is surrounded by old pals – like Danny Quane known as “Danny the Sock,” who has the next stall, and Harry Burns, who has been in this market longer than anyone else. Danny was brought up in Brick Lane and his dad traded on Cheshire St. 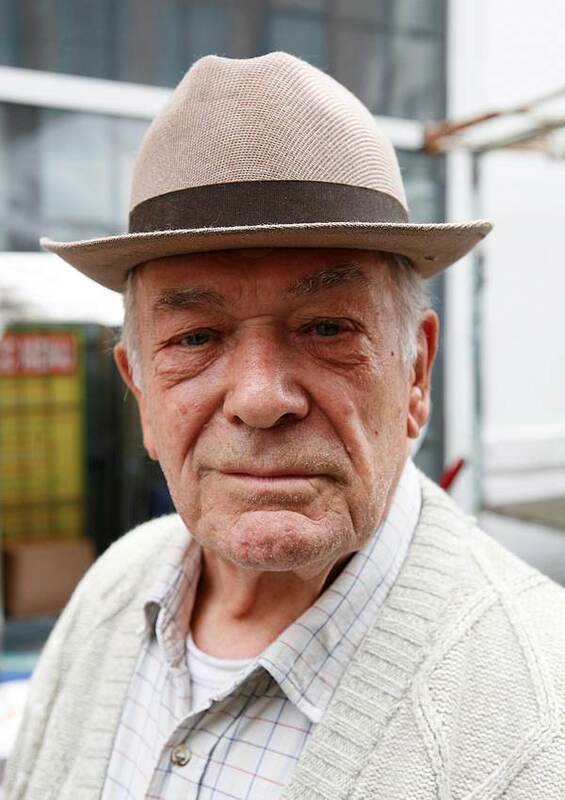 He has spent the last thirty years selling men’s socks and pants on Leather Lane, picking up the yiddish words used as traders’ slang in the market, such as “gimel” for three and “bice” for two. Harry Burns grew up in Hatton Garden during the war as one of a family of twelve children and recalls sleeping in bunks in the vaults beneath Smithfield Market as the bombs fell in the London blitz. Fired from his first job, making Italian ice cream, for eating too much of what he produced, Harry moved onto a spaghetti factory before he agreed to help out on a stall in Leather Lane, and stayed on for the rest of his life. “I’ve never lived more than a mile from here,” he confessed to me with a proud smile, “and I wouldn’t live anywhere else.” A dapper gent in a Homburg and brogues, Harry Burns is the grand old man of Leather Lane. 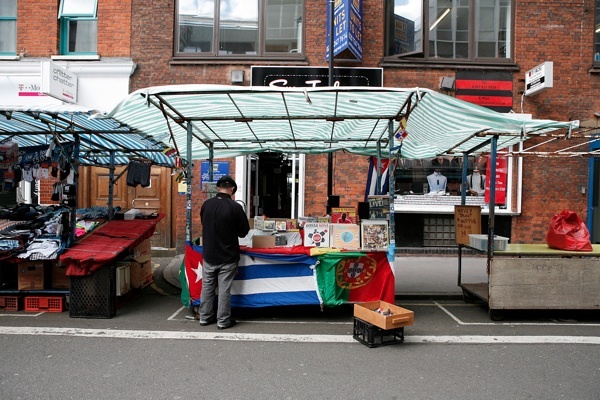 The market serves the office workers of Holborn and only operates over lunchtime. By three-thirty, Jimmy finished packing up and I joined him as, waving goodbye to Danny, he wheeled his trolley of records up towards the Clerkenwell Rd. We entered a former tramshed in the Grays Inn Rd where Jimmy stores his stock in the warehouse of his friend Zep who runs Stern Records, stacked to the ceiling with Reggae CDs that he exports to the United States. From here we walked through Lambs Conduit St, where Jimmy once had a record shop, stopping in to greet some of the long-term shopkeepers that Jimmy knows from the old days. Opposite the hospital in Great Ormond St, Jimmy took me down to his subterranean lock-up where he stores his stock from thirty years of trading, along with a few surprises. “I’m clearing out a bank in Mayfair tomorrow,” he joked, then – before I jumped to the wrong conclusion – explaining he was buying up furniture and fittings that he would store here and sell online, along with an exclusive range of Kung Fu Panda phone chargers that he got for a song. It was a warm afternoon and thirsty work lugging boxes of records around, so we were relieved to arrive at last at Jimmy’s flat next to Russell Sq and have a cup of tea. We sat in his living room in peace. 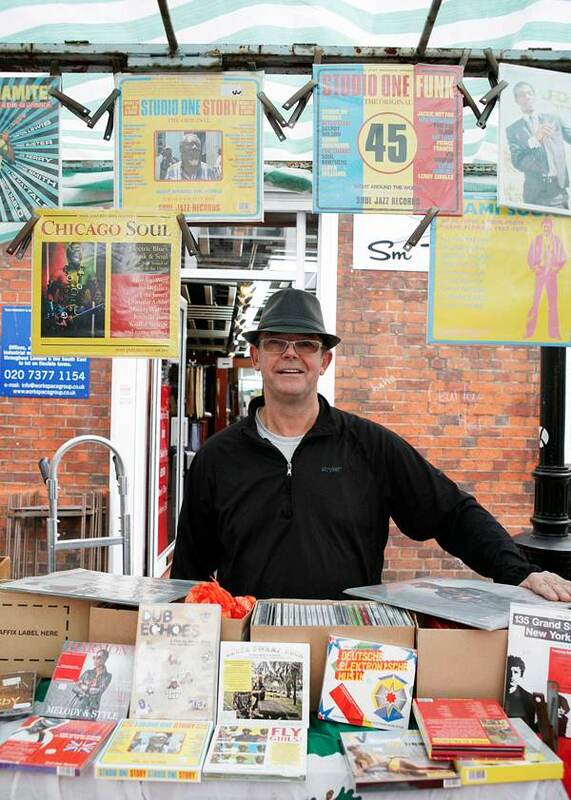 With one wall lined with his music collection and a window looking out onto a Nash terrace, Jimmy has found his ideal home – within walking distance of the market. Danny the Sock, dealer in men’s socks and pants for thirty years. Colin O’Brien’s exhibition of photography Commonplace is open at Christ Church Spitalfields this weekend and runs until August 26th. Open Tuesdays, Saturdays & Sundays 1-6pm. Fame again Harry!You are very special. How amazing to read: “gimel” for three and “bice” for two. These are actually from the Hebrew alphabet. Gimel is the third letter, hence three and bice is the second letter, pronounced bet in Hebrew.